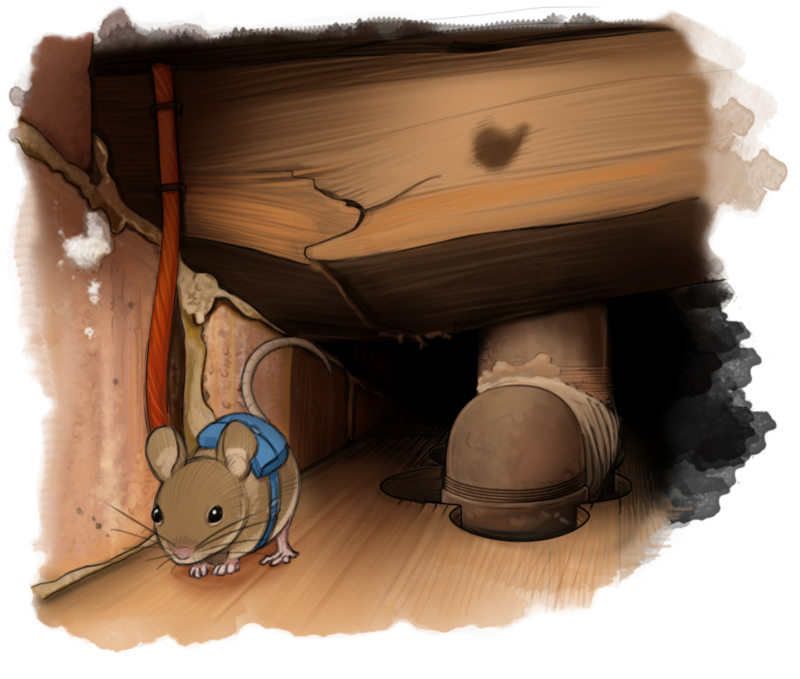 I've posted a couple of times about the game I am currently developing InBetween — a game about tiny mouse-like creatures (Hylins) living in the walls of human houses (what they call the Between). InBetween is a game I've been dabbling with, on and off, for a long time — a really long time (once upon a time it was called The Real World). It's been through a few different systems, some changes of setting, and LONG years of being ignored. This time I'm doing more. InBetween focusses on small Tribes of mice, and tracks adventures over the course of years (one adventure per season at most). Tribes are shared creations, and the game encourages you to switch characters, or at least to think about the fate of your tribe-mates as your own characters develop, age, and die. Character creation is life-path based, with plenty of random tables for those that like them. Gameplay uses D6 dice pools, specifically because they are wild and swingy — success is part luck, part planning (getting more dice). Luck — a meta-resource — allows you to choose which rolls you want to invest in. You can pass the tests that really matter, but you need to choose when to spend, and when to trust to fate. The system gives players lots of narrative control when they win rolls. The current version of the game has been in development for about a year and a half now. There have been a number of internal playtest groups (which are still ongoing), but the time is fast approaching when I'm going to be looking for more external playtesters. In the meantime, though, I just wanted to tell a few more people that the game exists, in the hope that some of you might be interested in playtesting when the time arrives! If you are, let me know here (or on the game's facebook page, or by email, or by messages tied to legs of carrier pigeons ... whatever works for you). You can find out more on the game's homepage, or by asking me questions (please ask questions). Why thank you! I've got an actual play of the current campaign https://forum.rpg.net/index.php?threads/inbetween-the-cold-stone-tribe.841266/ that has some more art. Why thank you! I've got an actual play of the current campaign that has some more art. Cool, I'll check it out later. I must admit, when I saw the word mice I immediately thought of MouseGuard, but there's no harm in there being more than one game about adorable little rodents.